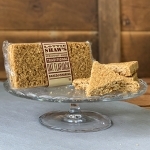 Baked with rolled oats our flapjack is a true family favourite. Baked for Sharing flapjacks that can be cut into 5 slices. They are perfect for picnics or to keep in the cupboard and slice a piece off whenever you fancy.